If you're a bride looking for something different for your wedding dress, then keep reading! Our 'Misfit of the Month' for August creates unique and beautiful outfits which certainly have the 'wow' factor! 1. 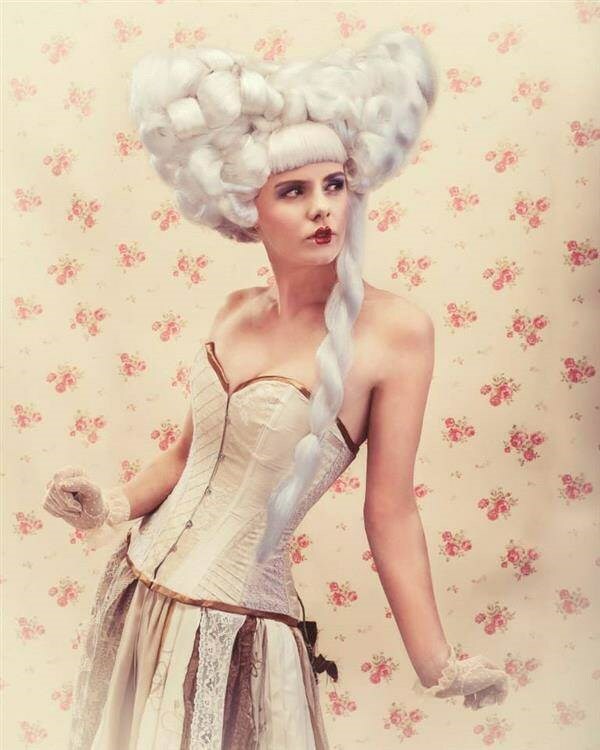 Steampunk wedding dress / corset. All photo credits at end of article. So, who have we got in the hot seat to answer our questions this month? I am Lyndsey Clark, an alternative wedding dress, corset and costume designer-maker...And a cycling- Recycling- tea drinking- peanut butter scoffing- sci-fi novel connoisseur, based in Reading, a big town about 30 miles along the river Thames from London. 2. 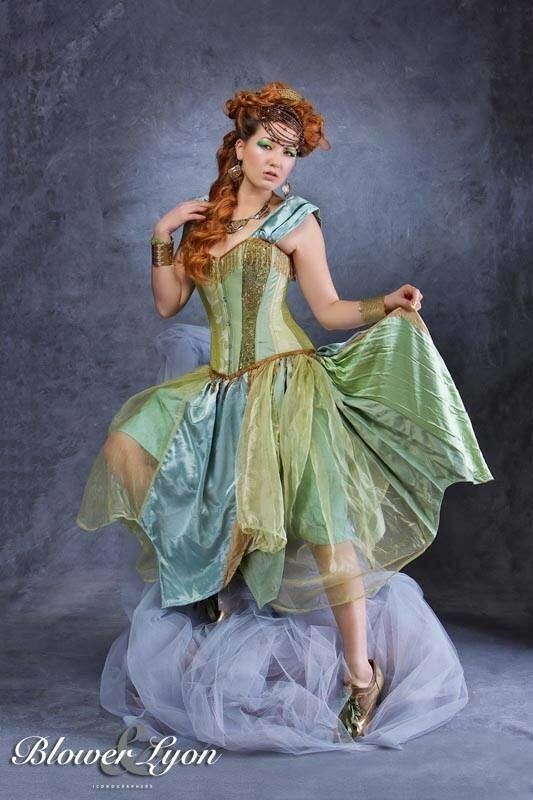 Absinthe unique alternative wedding dress. How long have you been designing and making clothing? I have been self employed since October 2011, but I was doing this long before I made that leap! - I took a fashion design HND, a BA(Hons) and several advanced technical courses in corsetry, lingerie construction and tailoring. On graduating, I volunteered for Oxfam GB, this is where as a volunteer I became the founding, and lead contributor to ‘Reworked for Oxfam’ an exciting sustainable fashion boutique where we remodelled unwanted textiles into one-off couture items. Then I left Oxfam to make couture wedding dresses and all manner of bizarre outfits, and I still use a lot of recycled materials. 3. Bride Davina in her feather wedding dress. What goes into creating one of your fantastic wedding corsets/dresses? For custom orders; first I discuss the ideas with the customer and develop an illustration, which we modify until we have a clear goal. Next I measure the customer, or have them measure themselves and send me the measurements (most of my customers are the other side of the world, so measuring in person isn’t an option, but I go over it all with them via video calls and email if they need any help!). Then I draft the pattern to their measurements and shape requirements. 4. 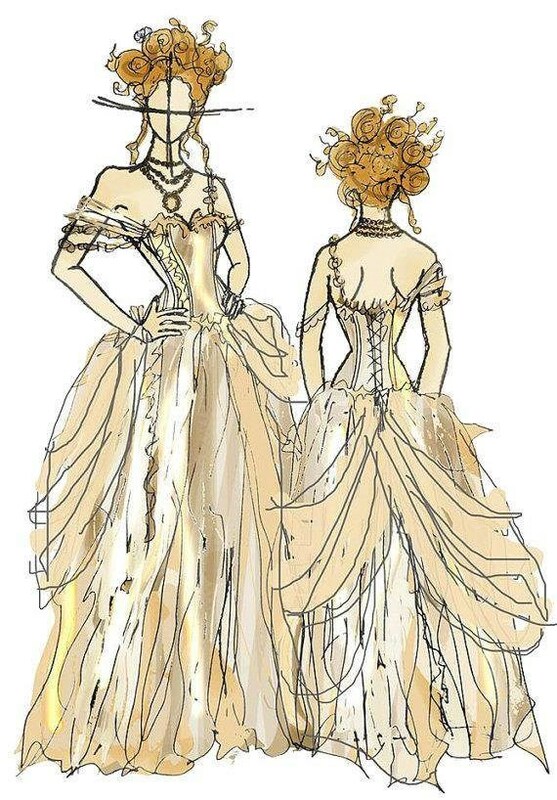 Lyndsey can create superb illustrations to help brides visualise their dress. Next I source appropriate materials, trims and embellishments. I cut all the layers for the corset (3-4 layers, depending on the materials selected). I mount the outer fabric on coutil (a rigid corsetry middle layer) and sew together all of the panels, double stitching everything. I sew bone channels, cut, cap and insert the bones (7mm sprial wire, and 7mm flat steel back bones) I sew in a steel busk and a waist stay. Next I seal everything in, double stitching the top and bottom of the corset before bias binding the edges, this I do by hand to ensure an even, professional finish. Next I mark the eyelet and washer positions and fix them in place using a mechanical press. Finally I make and attach a modesty panel, and any embellishments. I then draft, cut, make and embellish matching skirts, petticoats, bustles, boleros, hair accessories….whatever the custom order requires! The entire process, start to finish usually takes around 5 months. I take and send photographs to the customer at several points in this process so that the customer can have their input on decisions. 5. Alice in Wonderland wedding dress. Wow, so a lot of time and effort clearly goes into your work! At what stage of wedding planning should a bride-to-be contact you if she want to make place custom order? Typically I need the order to be placed and the design process to begin about 5-6 months before the dress needs to be shipped. And I liase with the custom throughout the process to be sure the end result is exactly what the customer's heart is set on. I mostly make custom orders, and every item I make, custom or not, is a one off, as I never make two identical items as a rule. 6. 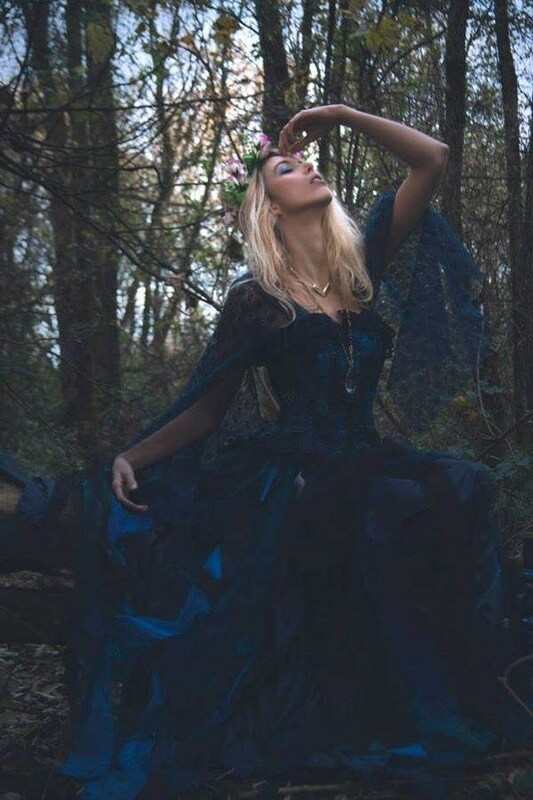 Gothic blue bridal gown. All over the place; I love theatre and performance, so a lot of my work reflects my love of bonkers theatrical costume and burlesque. 7. Baroque doll, steampunk / gypsy wedding dress. Can you tell us about some of your favourite designs? Oooh, I think my current favourites include a ‘Game of Thrones’ inspired design; It was stoney grey, turquouise and peach, with a ragged, tiered skirt and little grey feather trims. And another favourite would be a blood red dress I made a couple of months ago for a Halloween wedding, such a beautiful colour, and the dress had a lot of depth and texture, with all these beautiful velvets and silks. 8. 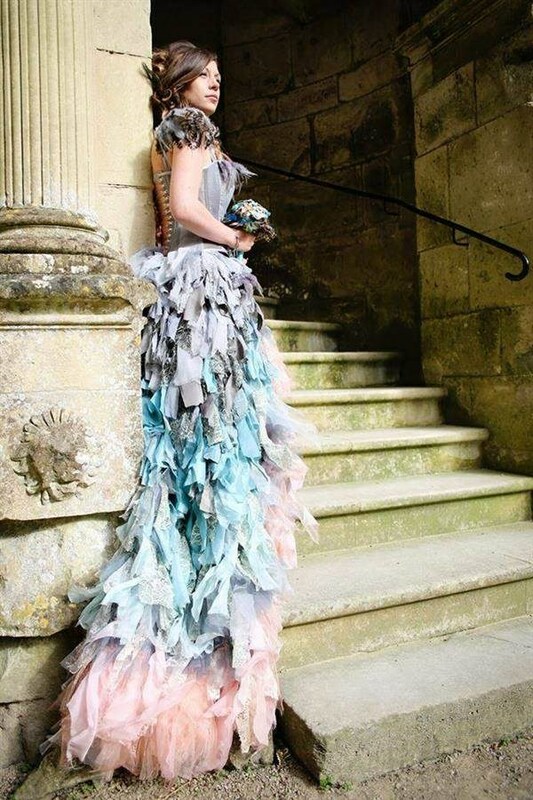 Game of Thrones inspired wedding dress. Which styles/themes are the most popular? Steampunk, always Steampunk- It’s huge! 9. 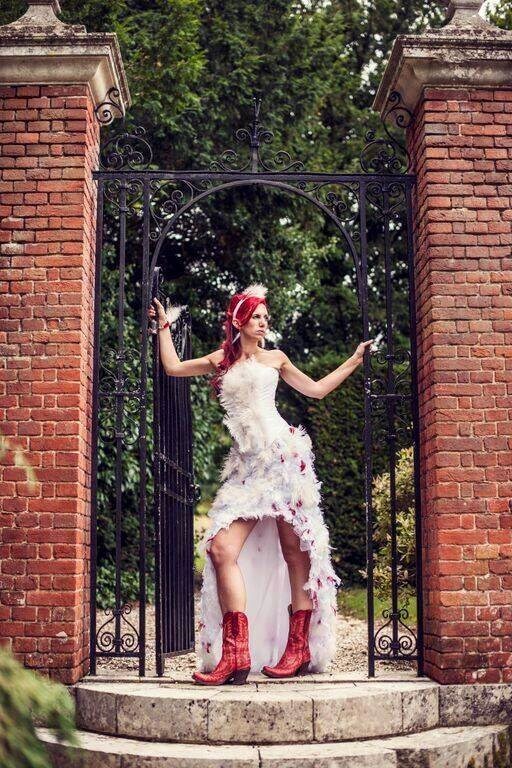 Steampunk Victorian corset wedding dress. What’s the most unusual wedding outfit you’ve created? 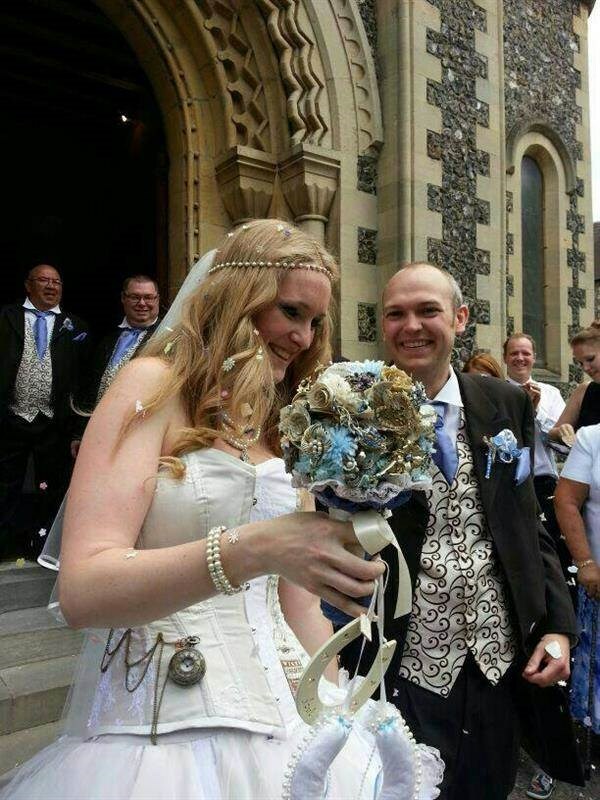 I recently made a Doctor Who themed wedding dress…and a dress out of paper…and another covered in feathers. I get all of the most exciting requests! 10. 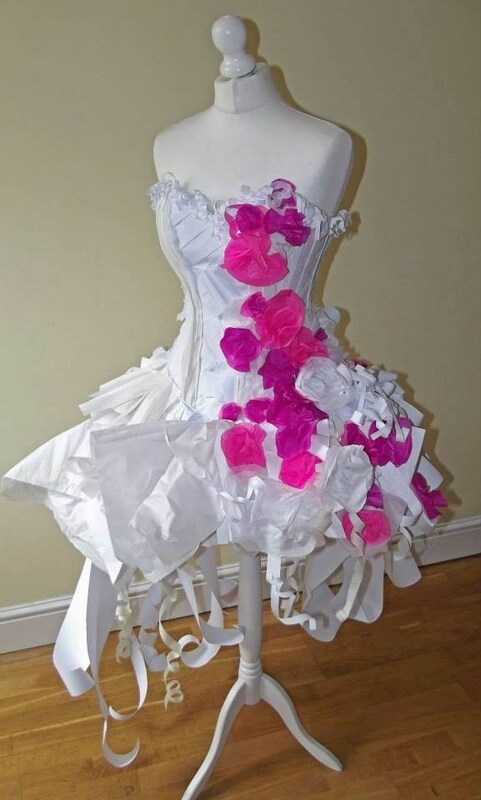 The paper wedding dress! May we ask what you’re working on at the moment? Right now I’m working on several orders; one is a Cinderella-esque ivory ‘rag dress’ kind of bohemian and raw, with lots of lace and texture; A peacock blue wedding dress; and purple and champagne tiered wedding dress. 11. 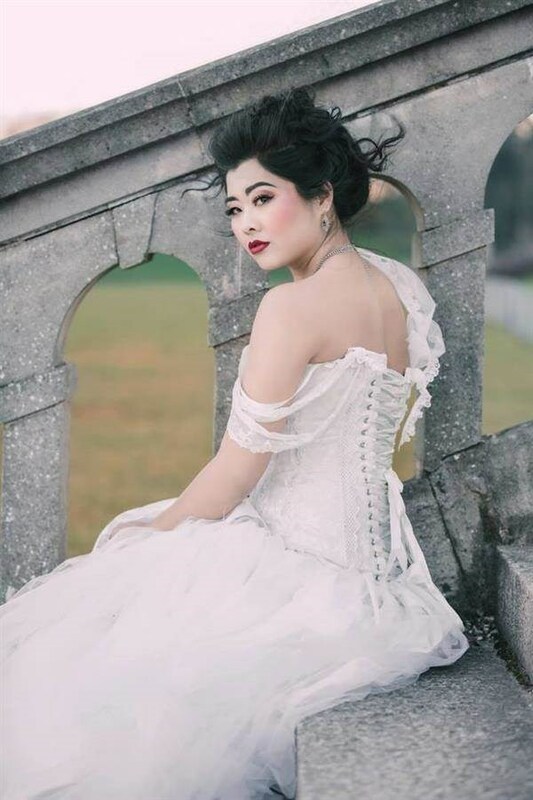 Classic vintage style ivory white wedding corset and skirt. I get to make beautiful things all day, everyday! What makes your work stand out from the crowd? I think the uniqueness of every item I create, and the personal touch are huge points, as is the fact I let the customer lead if they want to. A lot of brides find me because they simply cannot get their outrageous ideas realised by a more traditional bridal wear designer. If you want an orange dress with flowers all over it, or a wedding dress covered in leather, who am I to stand in your way?! 12. 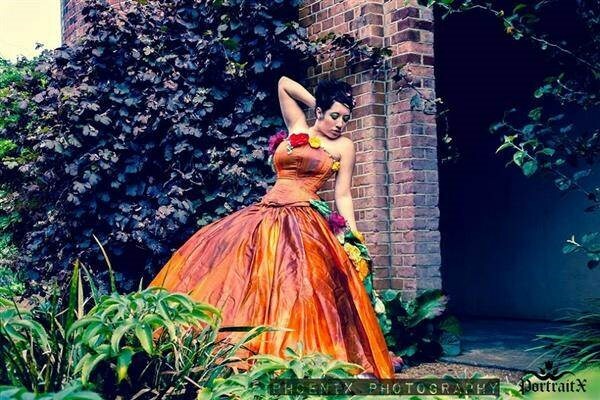 Orange woodland hippy bohemian corset wedding dress. What can customers expect if they chose you to design and make their wedding outfit? Passion, precision, creativity and attention to detail. 13. Another beautiful and unique wedding dress embellished with flowers. Don’t let the stuffy traditionalists quash your imagination, do what YOU want! Thanks Lyndsey! You're absolutley brilliant at what you do and you've got us drooling all over these amazing dresses! Image 1: Photo: Stephanie Culley Photography. Model: Roxanne Claxton. Image 2: Photo: Blower Lyon. Model: Mir Shin Modelling. Makeup & Hair: AAB Weddings. Image 6: Photo: Danniella Jaine. Model: India Hammond. Jewellery & Accessories: The Midnight Deer. Image 7: Photo: Norbert Pietraszek. Model: Vic Rose. Hair & Makeup: Anne Veck & Rebecca Steele. Image 8: Photo: Jay Spicer & John Worsfold. Image 9: Photo: Danniella Jaine. Model: Sarah Christy. Hair & Makeup: Blush. 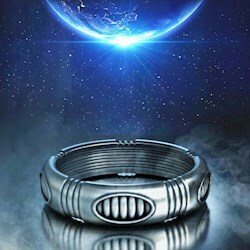 Jewellery & Accessories: Sword and Bough. Image 11: Photo: Sarah Ann Wright. Model: Twig - UK Model. Hair & Makeup: Victoria Percival. Jewellery: Noctua. Image 12: Photo: Phoenix Photography - Portrait X. A Perfect Dress For Nicole & Ron’s Steampunk Wedding!